Etermax will release the sequel to its hit quiz game Trivia Crack on October 25th, but before it officially launches, I've decided to go hands-on with the title so that our readers will know what to expect from the upcoming release. Etermax has made it clear that Trivia Crack 2 has been redesigned to offer more enjoyable elements and an enhanced competitive flavor over its predecessor, but what does that really mean? To find out, click the read more button below. I would like to briefly mention that Trivia Crack 2 is a title that's still in testing. Due to its unavailability for the majority of Android users, I have sideloaded the APK (version: 1.3.1) to report on how it plays. There may be a few adjustments made to the game before the stable release officially launches, so please consider that when reading this hands-on. Okay, so it would seem the base quiz gameplay found in the original Trivia Crack is also included in this sequel. You can choose to play against a friend or perfect strangers. Six categories make up the wheel, plus there is a crown that lets you select from any of the categories you wish. Whatever the wheel lands on determines the type of question you will have to answer. Your goal in this mode is to answer three questions correctly in a row, and then you'll get a chance to pick your category for a question, and if you get it right, you unlock a character. Whoever unlocks all six characters first wins. Of course, if you happen to get a question wrong, an advertisement will play (this gets annoying really fast), and you lose your turn. You only have so many turns before you completely run out, so you have to make sure each one counts. It's a fun system, though players do have the chance to use power-ups before they answer a question, which seems unfair for those that choose not to use or pay for them. This is one aspect I do not enjoy since it clearly leans towards pay-to-win gameplay. Here is what the classic mode looks like, including the out of lives screen. Of course, this release would not be a sequel if it didn't bring along some new content, so besides the base mode, there's also a Tower Duel and a Daily Challenge. The Tower Duel offers something a little different. Your goal is to answer more questions in each category than your opponent, and since this battle plays out in real time, it can be a struggle to keep your points in each subject, which is a big part of the fun. As for the Daily Challenge, well, all you have to do here is answer a bunch of questions in a row. It's broken up into segments. At first, you only have to answer five in a row, and then you have to answer ten, and then fifteen, and then twenty. Each of the four sections will net you some rewards if you clear them. There are also a few tasks that you can complete that are separate from the three modes of play, and they tend to consist of simple things, like answering twenty questions in a row or winning six characters in the classic mode. Gameplay of all three modes. Please excuse the missing sound from the first 2 minutes. Recording Android games can be finicky. The graphics are still relatively simple, but that's not necessarily a bad thing. You can tell they've been slightly improved over the original's flat theme. Buttons now have highlights around their edges that make them easy to differentiate from the background, and I also noticed that 18:9 screens are supported out of the box. It's definitely nice to see the game fill the screen, instead of the current letterboxing going on in the original title. The touchscreen-only controls in Trivia Crack 2 work just as good as they did in the original release. Navigating each menu is as simple as tapping on the correct icon, and spinning the wheel for each turn is just as easy. Really, when it comes to the controls, you can't get much simpler than a trivia game. Here is where things get tricky. The in-app purchases range all the way up to $99.99 per item, and there are a couple of ways to spend your funds. For the most part, these IAPs are for purchasing in-game currency, but there are also some item packs that consist of currency and power-ups. This is precisely why the game leans towards a pay-to-win structure since you can easily pay for a leg up over your opponents. I'm definitely not a fan of this setup, and would rather see that the only way to win a competitive quiz is through skill and not purchasable cheats. If you enjoyed the original Trivia Crack quiz game, then you'll probably have fun with this upcoming release. 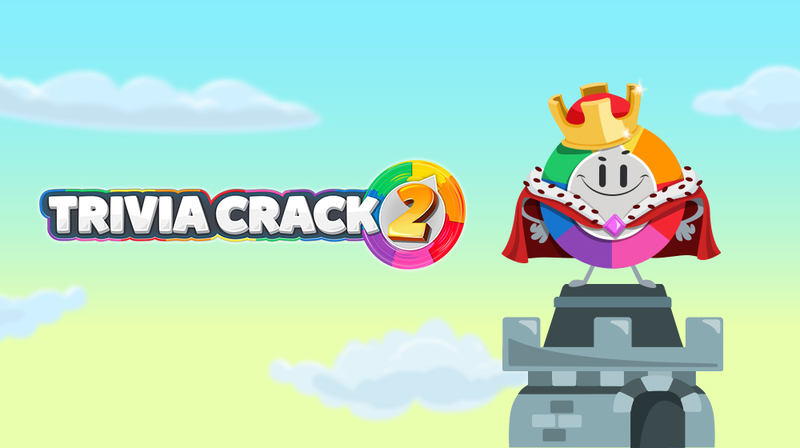 Trivia Crack 2 offers more of the same enjoyable quiz-based gameplay with a few improvements. The UI has been tweaked for modern devices, and there are a couple of new modes to work your way through when you get bored of the core gameplay. I'm obviously not a fan of the monetization used, but there's still plenty of fun to be had for those that play for free, just don't expect to be able to compete with anyone who pays for their power-ups. The false limit on how many times you can play in one sitting is also distasteful and interrupts the flow of the gameplay, but that's to be expected of a free-to-play casual game like this. Really, there are few surprises here, and even fewer changes, which begs the question why we needed a sequel when an update to the original would have sufficed. Still, the new UI is a welcome addition, and the new modes add something to break up the monotony of the core gameplay. So if any of this sounds good to you, feel free to hit that pre-registration button in the widget below.